Do you want to take bookings through your website, then why not have a WordPress booking system installed? This will allow your customers to easily book an appointment or make a reservation online. At prestige our WordPress experts will advise you on the best type of booking system plugin to use and integrate it to your website. So, whether you are a hairdresser, have a holiday rental or are a language tutor then giving your customers an easy way to book or make appointments online via a pc or mobile devices will help increase your sales. Let customers book hourly, daily, weekly or monthly appointments with you! 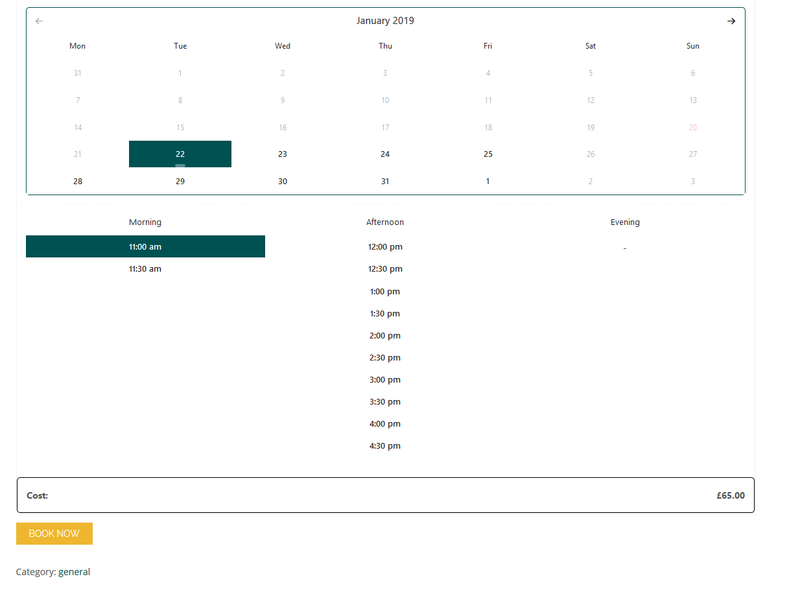 What should a booking calendar do? Customers should be able to book times or slots from your available business hours. It should work perfectly on all mobile devices as well as desktop PC’s. A good booking system will save your appointments or bookings in your WordPress database or update a calendar like the Google calendar. Send automatic email confirmation to your customer confirming their booking has been accepted. Different types of systems available. For this type of industry a booking plugin is an absolute must. Offering your visitors, the ability to book their stay on your site is invaluable. Your hotel booking system would need to manage rooms, reservations, prices of your rooms or advanced features like showing room availability for specific dates, taking advance percentage payments right through to cancellations. Why not streamline your surgery by allowing your patients to make their own appointments online? 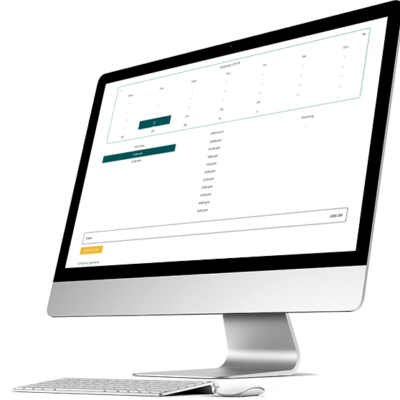 The main features of this appointment system is you can allow patients to book appointments at convenient times, create and manage prescriptions, patient billing, keep patient records, manage multiple chambers and easily configure scheduling plus much more. You can have your customers booking tables and reservations on your website with ease. There are many options available for restauranteurs and here are some of the main options you would get, easily confirm or reject bookings, send out customer confirmation emails, restrict booking times and dates, even allow customers to pay and use discount codes or coupons. Not sure what type of plugin to choose? This is an appointment and booking form plugin that offers quick and simple integration of a booking system to any WordPress website. You can easily modify Startbooking to suit your needs including adding working hours, time slots, multiple services, allow your customers to choose certain staff members and it also has an excellent dashboard area where you can manage your bookings. This again allows you to add a professional looking booking system to your WordPress site where appointments can be booked and payments can be made online using PayPal or credit cards. Not only that but you can sync the BirchPress booking plugin with calendars including Andriod, Outlook and Google Calendar. This is a very popular booking calendar system and it has been noted that this plugin in particular has over 40k active installs. It is a multipurpose system that offers appointment and reservation bookings for your website. Other great features of this plugin is that you can import feeds from 3rd party sources like Airbnb or TripAdvisor etc. You can also take payments online plus it has a built-in captcha to help prevent spam. Bookly is a booking plugin that powers the bookings and scheduling of your services. This type of appointment system is known for being best suited to salons, education/tutoring, dentists and health and wellness websites. It makes easy work of booking appointments on mobile devices for clients that are on the go. 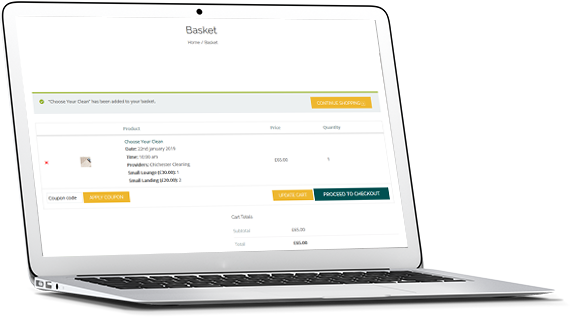 You can take payments online through Bookly and you can manage your clients effortlessly in the user-friendly admin. Another great plugin for creating a booking section on your website, the WPForms system allows you to create booking forms directly within the WordPress dashboard and can easily be integrated with any 3rd party app. This booking plugin has many customisable options and you can also integrate your webforms with email marketing services like Mailchimp, GetResponse and more, it also supports payments online by using PayPal and Stripe. 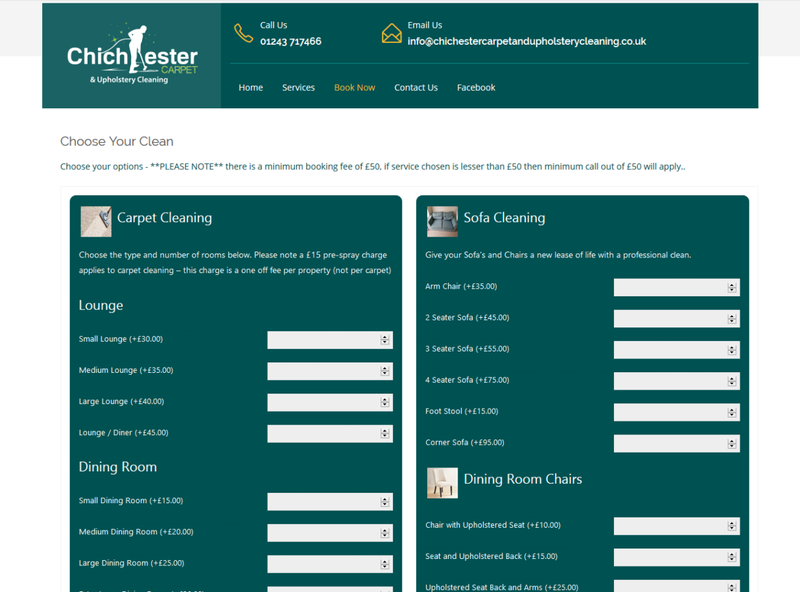 We created this appointments page for Chichester carpet and upholstery cleaning. Click the first image to view the page. Why would I need an appointment system? We can carry out a website audit to see if you are the type of business where your customers need to book appointments or make reservations to use your services or products. Providing your customers with as many different ways to book with you is important, so why not add a WordPress booking system to your website to increase your sales and conversions? When you add a reservation system to my site will it be responsive? Yes, it will, all of the websites and plugins we build are always responsive. Having your website easily accessible on mobile devices will ensure you capture a large customer base. In 2018 over one third of consumers used a mobile device to book a hotel room and this is set to rise. Do I need to use a plugin for my booking system? No, we can build something from scratch, but this would be more expensive as it would be more labour intensive for us so more hours would be spent on building your system. There are many different plugins available these days and they all have the ability to be customised to suit specific requirements you may have, so we always recommend using a plugin as it is a more affordable option. Do you offer training on how to manage my appointment system? Yes of course, we offer training and WordPress help which is free for the first year and we will supply written guides to help you get used to working your appointments system. 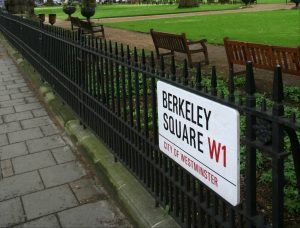 A member of our web design team will be here to assist you whatever your query. Do you need a booking or appointments system? Get in touch with our team of experts to find out more about what type of WordPress booking system or appointment plugin would be suitable for your business and start getting customers making reservations, appointments or bookings with you today.